One thing that has to be said about the Maria Denmark Kirsten Kimono Tee is that it is a quick pattern to make even if you alter it. So Friday night I decided I wanted a new dress to wear to book club (which was on Saturday night for The Handmaid’s Tale by Margaret Atwood), I needed something that is easy to make. 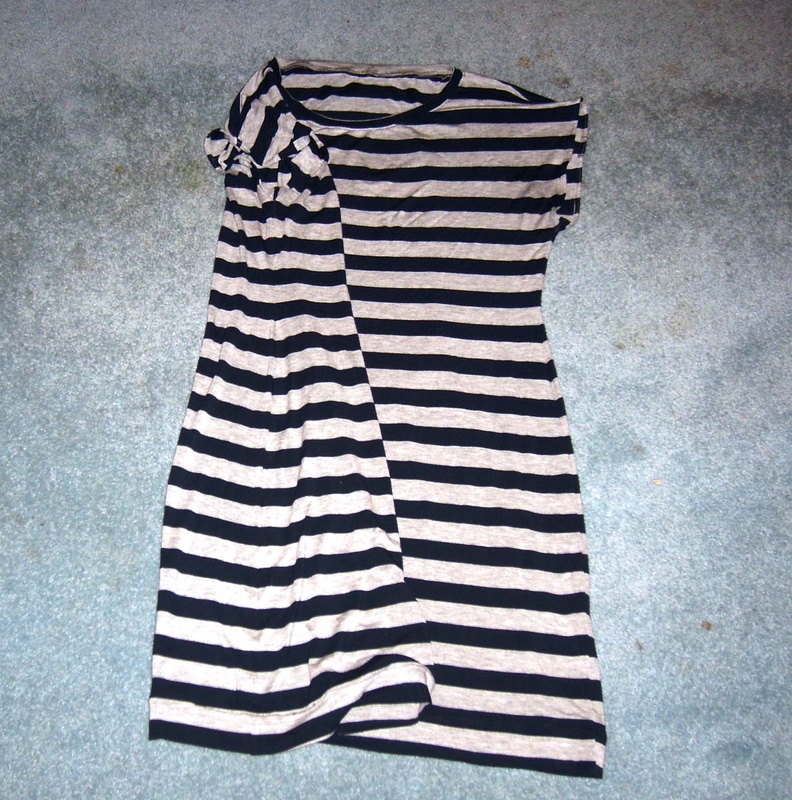 I probably started out a little after 7:30 pm by tracing out the Kirsten Kimono tee and modifying it for a dress. I added 9 inches to the bottom with an ever so slight taper out. I am not even sure if that is noticeable. 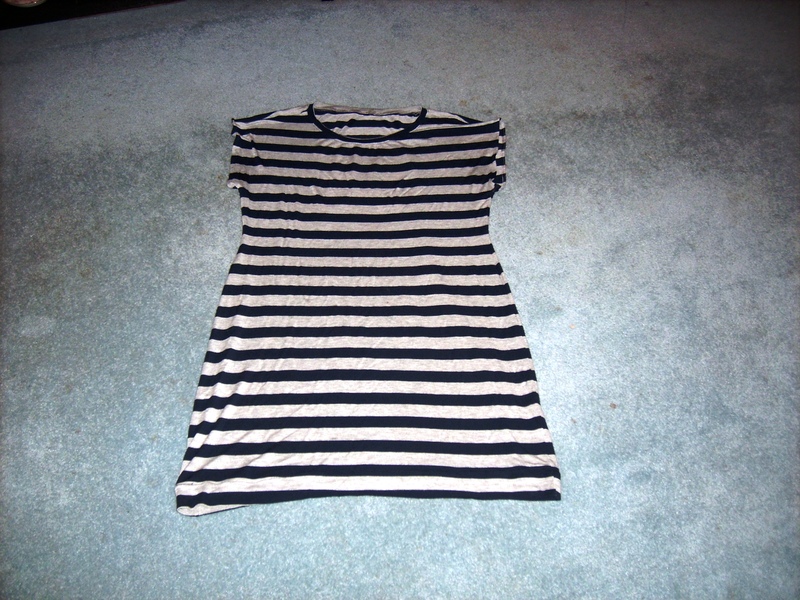 The only pre-washed knit was the grey/ navy stripe rayon jersey. If I want lovely matching side seams, it will take more prep time. Before even placing the pattern pieces on there, I sat and pinned each stripe on the fold and edge. Then I placed the pieces on top to cut out. Shoulder seams were sewn first and reinforced with clear elastic. The side seams required extensive pinning to make sure the stripes were matching on the front and back. By around 10:30 at night I had the hem and arm-scythes completed. The next morning I finished up the neckline. I calculated 21.92 inches on the neckband, but I used a 21.75 inches for the length instead. It was easier to measure out using my cutting mat. The 21.75 inched worked well. I used the same size combo as before, the medium for the bust and waist and the x-large at the hip area. I was looking at how the dress looked on me one night. It looks like I could pull in each side seam an extra quarter-inch (reduce by one inch total) and still have a fairly relaxed look dress. 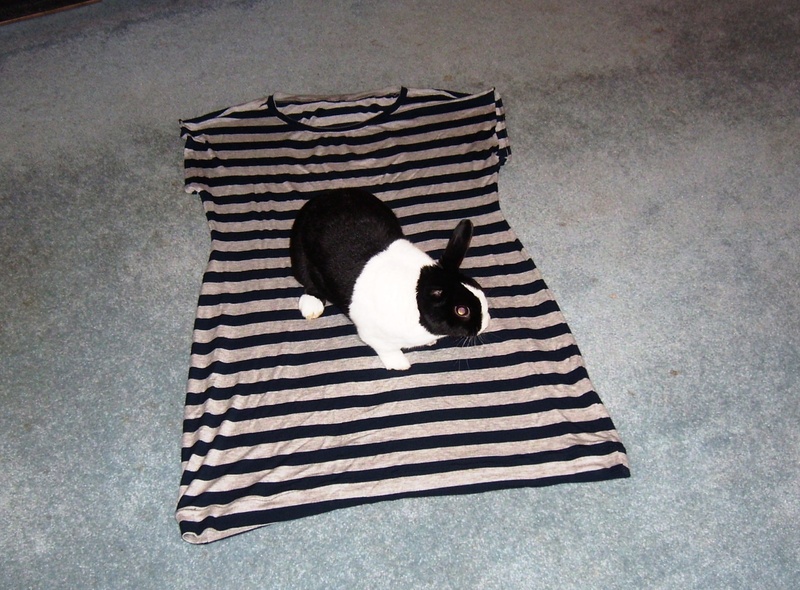 But I think I will leave it like it is since it did get bunny approval.